Review: Instinctive acquisition made easy with LaserMax LMS-G4-17 guide rod laser. Clearing a house and shooting in confined spaces is efficient and effective with the factory zeroed laser system. If you are new to our readership, and haven’t done so already…check the previous review done on the LaserMax guide rod laser that we installed into a custom Glock 43. Should you decide to read this one first, jump over to our custom EDC project, you may decide that LaserMax has a laser solution for just about every shooting application that you dabble! The installation process did not require anything more than a basic knowledge of the working parts of the weapon system it was going into and a Glock tool. We put ourselves on a stopwatch and every bit of 10 minutes of our lives was chewed up from start to finish, with no confusion and straight forward assembly [we got the 10 minutes back at the range]. If choose not to take our word for it, LaserMax has published real time instructions found on their Youtube channel that walks you through the process; step by step. Prior to disassembly, it is imperative that you make sure your firearm is clear. Below is a bulleted narration of what we found to be the most efficient way to disassemble and re assemble with LaserMax LMS parts. Now that the easy part is over, it is time to install the battery pack into the Guide Rod/laser assembly. Insert the 3-battery pack into the laser [+ side up]. We found this to be the trickiest due to the plastic construction of the battery cap and the even pressure required to ensure secure fitment. In any case, LaserMax has made the process easier by molding an index groove to allow the cap to be installed correctly. The LaserMax Guide Rod installs into the barrel block and slide the same way the OEM does, with the exception of the battery cap resting on the first groove of the barrel block assembly, instead of the bottom (notched) groove. This allows for the the activation switch to move freely and negates the laser from constantly transmitting. Reinstall the slide to frame and move the activation switch [slide lock] from left to right, ensuring proper function of the pulsating red or green laser. Some will staunchly disagree with [our opinion] regarding visible lasers in a tactical or combat driven application. From what we have seen, people either love or hate visible them. As the natural progression of threats continuously change, and the overall idiocy of people becomes more prevalent…Lasers of any kind are finding relevancy in just about any scenario when bad people do harm [or attempt to] towards good people. Back to the ever so controversial combat application topic. Before we proceed, it is imperative that we throw a few scenarios into categories. All of which would be considered “tactical” even in the absence of body armor and helmets. The word tactical has many meanings and in today’s seemingly endless borders of SME’s, the meaning stretches even farther than before. Nonetheless tactical [for all intent and purpose] means to apply judgment, movement and practical application to the art of gun fighting. Home Defense: Is as ambiguous as the Glock/1911 debate. It seems that nobody can agree on the “best” method of thwarting an attack as it pertains to the use of force. Some say shotguns, others say ARs, yet seemingly most, remain true to their convenient and accessible handgunning methodology. We find ourselves somewhere in the middle for this topic. We can appreciate the contrary points to over penetration and in some cases incapacitating (to others) pressure exuded from the 556 or 308 rounds commonly fired from the AR. While fully understanding the importance of suppression, especially in a close quarters/home defense situation. There is an application for ARs in home/close quarters defense. From the beginning of our tactical careers it has been one of the single most common points driven into our heads from those who were responsible for transferring information about shotguns; they are the ultimate force multiplier. The sound of the pump action from a Remington 870 [or similar] catches the attention of virtually everyone who is around and more times than not…stops them in their tracks. Well and good…but like ARs Shotguns are not the easiest to store responsibly, especially when you have kids and wandering minds in your house. 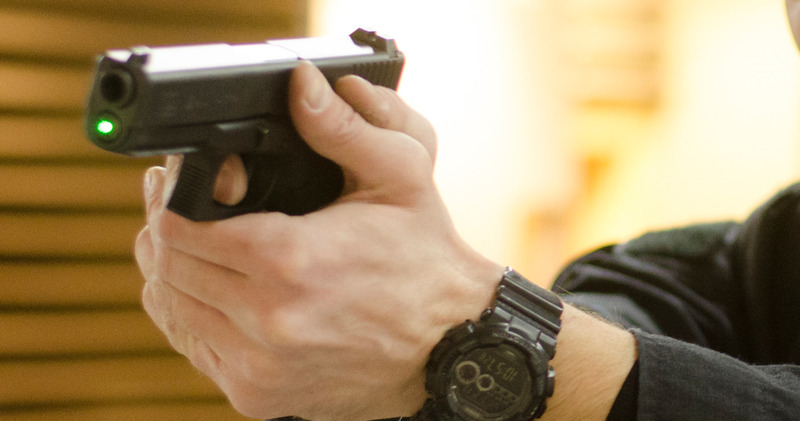 The pistol…and in this case the Glock Pistol being our test subject. The full-sized Gen 4 17 to be exact. We have counted on this pistol for many years as our side arm while gallivanting around in support of the GWOT. It is what we know, what we train with and what has worked for over a decade. Our G17 is stored next to our bed, locked within Hornady’s Rapid Safe. It allows for quick access, yet impossible for kids to get into regardless of curiosity levels…so long as the RFID or key is not readily accessible. We ran our G17 equipped with a LaserMax LMS-G4-17 through a series of tests throughout a shoot house in a quaint little mock village at a training site outside of Kabul. LaserMax builds each product from a perspective based application. Pistol lasers will not give you the range that one mounted to a rifle does, and in this case does not have IR only capabilities…after all you’re not taking rifle distance shots with a pistol anyway, and the majority of the LaserMax customers are concerned with the defense of their family, and not fighting in the longest war our country has ever been involved in. In both cases, the laser does have a place. Pistols are used for close engagements, so the lasers we equip them with should possess the same, anything else is a waste of money! As we moved through the house, the LMS stretched far enough to engage targets from other ends of average [20-30 feet] hallways. Its pulsating red dot aligns itself perfectly to the top of the TruGlo [TFX-Pro] sights that we have installed onto our duty pistol. The LMS dot was unmistakable and remained where it needed to be and toggling the switch upon room enter. We are creatures of habit [as exclaimed before] naturally our eyes track to the tip of our front sights. LaserMax applies unsurpassed precision to every product. With this, the LMS is centered from the factory [zeroed] to the center most point of the bore. Allowing for minimal offset and compensating when engaging targets. This feature also removes room for error in over compensation and loosening of set screws during firing sequences, as seen with other pistol lasers. Regardless of what pistol you shoot, if LaserMax has a system for it…its zero is set at the factory, making the LMS a plug and play solution to quick targeting. Vehicle Gun fighting: We dare not to venture down the rabbit hole of shooting through windows (in this piece anyway). During this test, we found that vehicle defense made the most sense for the use of the LMS laser. It is very hard to set up for the endless scenarios concerning engaging targets/people from a vehicle. For this, we are applying the KISS method of driving our point home! To paint the picture; we are sitting in our vehicle and the need arises where we have to switch to guns and engage targets. 9 of 10 times a perfect presentation to surprise break is not as attainable as the keyboard commandos like to portray. In a split second, you will need to index your pistol and work to mitigate whatever you perceive is a threat to yourself or anyone else. The LMS enabled us to do just that, with minimal time and effort. A simple push of the activation switch, the pulsating red dot was present and our shot placement sequence began. For this test, the adversary…a paper target and a MGM mini IPSC steel silhouette. We evaluated the feedback from the holes punched, rendering the LMS laser rod…a true force multiplier in quick target acquisitions when shooting in and around our vehicles. If after reading, you are convinced that any of LaserMax products are a must have; please understand that shooting with lasers is not as easy as many would suggest [at first]. Once you have done your due diligence and have become proficient with them, it doesn’t make sense to go without! Our initial outing and first impression with the LMS was with a Glock 43; one of our primary carry pistols on the mean streets of Henry County, Illinois. Though the function and controls are identical between it and the 17, to compare the platforms is apples to oranges. The 43 was tested in lower light conditions where the laser was unmistakable regardless of placement and within extreme close quarter distances. To test the LMS 17 in full lighting conditions, took some getting used to nonetheless. After the first 100 or so rounds, the muscle memory started to take hold and tracking the dot [aiming point] was not such a large feat as it was upon initial installation. The lighting conditions were less than optimal, as horrible air content projects a natural glare and at 5700 feet the sun seems a lot brighter than it is does at home! We began our test in a simmunition house [live fire shoot-houses are a logistical nightmare to facilitate around here] but we were able to achieve our objective in quick target acquisition with simulated engagements. We strategically placed “IZZY” targets throughout the house and in the best locations possible to simulate a lot of what the laser was designed to do, but in a tactical application. The first target presented itself approximately 15 yards away at the end of a long hallway. As we made entry, activating the laser and drilling high center of IZZY was virtually effortless. The pulsating function of the LMS17 added a level of focus that kept our eyes from crossing or losing the focus we needed to remain accountable for the rounds that we would otherwise shoot. A soap box that LaserMax stands on quite frequently when talking about their laser products. At the end of the day…once the human eye focuses on a point [in this case] target, the cornea will eventually become strained causing blurred and out of focus vision. This is one of many features that this simplistic, yet precise product possesses to enable to be more effective in your end use application. Once we made it around the house each target was as easy as the next to acquire the pulsating red aiming point to and simulate a controlled press of the trigger. In the conditions we were in, dust and dirt are a commonality, neither of which seemed to affect the laser/guide rod in operation and function. In lesser quality lasers, we have experienced reflection and instances of the laser blurring while in use. LaserMax LMS17 remained tight and crisp throughout its use. Is where we tested accuracy and ease of use while engaging targets. We set the MGM IPSC steel with IZZY not far from it. We engaged each target from seven yards back to 12 and were able to get effective rounds onto target. The anxiety that comes with training around vehicles was removed due to the laser. Much of the time, the thought is in the back of our minds of dragging a round across a hood or quarter panel. In this instance, if the red dot wasn’t pulsating directly to the target…something obstructed its path…. therefore, the bullet will follow the same. Once activated the LMS projected the aiming point and shots were taken with ease. Shooting with lasers is an acquired taste…developing the muscle memory to subconsciously activate the laser and identify it goes against everything we were taught from the day we picked up our first firearm. Having the ability to transition back to iron sights without using the laser as a crutch can be a challenge if you don’t make it conscious effort. Yes, it seems like a lot going on when seconds count. We have found that training and familiarization tops the priority list before we installed the laser system for daily carry and use. As with everything, we encourage you to gain and maintain a level of proficiency before you add this tool to your toolbox. At first glance, the LMS laser system is on the pricey side. As a matter of fact, about half of what a new Glock 17 goes for. The value does outweigh the cost, from our perspective. Knowing the engineering and attention to detail that goes into each laser and durability that is second to none, the LMS 17 was well worth the price, and stood up to the rigors of overseas use and application.